Modern heating and chilled water systems can suffer a variety of operating problems leading to poor performance or poor energy efficiency. It’s no exaggeration to say that the majority of systems we look at either have inherent design problems, are incorrectly installed or are being operated in a way that incurs far more energy consumption than necessary. Some of these problems are immediately noticeable by the occupants of the building. Uneven heating or cooling can arise due to poor water quality or ineffective system commissioning. Parsloe Consulting Ltd operates in collaboration with Whitewater Technology to provide an independent specialist water treatment consultancy service. Newly installed pipework systems can contain literally anything that is physically capable of fitting into the pipe. This may include dirt, sand, jointing materials, welding slag, plastic bags, tin cans, hard hats etc. When system pumps are switched on these items are lifted by the flowing water and carried to valves, pumps, boilers and chillers sometimes causing fatal damage. It is essential that this material is flushed out of the system before commissioning. A systematic process of dynamic flushing must therefore be implemented. Corrosion is also a significant risk. Most pipework systems contain steel. Steel is a popular choice because it is cheap and strong. However, it corrodes rapidly in the presence of air and water. 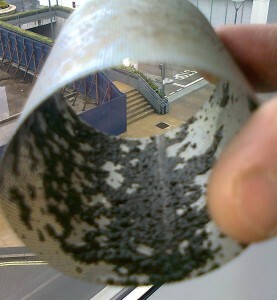 If deep corrosion tubercles form, the process may become irreversible resulting in costly pipework replacement. Corrosion that occurs during storage or installation of pipes should therefore be removed using a suitable chemical cleaning agent. On-going corrosion should be reduced by the use of corrosion inhibitor chemicals. Microbiological issues can also arise. Slime forming bacteria such as pseudomonas can cause a biofilm on the surface of pipes that breaks away causing blockages in valves. Nitrite reducing bacteria can deplete the concentration of nitrite based corrosion inhibitors leaving pipes at risk of accelerated corrosion. Sulphate reducing bacteria can survive under existing corrosion deposits or inside corrosion tubercles. By liberating oxygen from surrounding sulphate molecules, severe pitting corrosion can ensue. These problems can be avoided by an effective regime of pre-commission cleaning followed by on-going water treatment. We can advise on the process of pre-commission cleaning. This may include checking the design to ensure that cleaning facilities are properly included. It may also include reviewing the cleaning method statements for individual projects. Where water quality is in question we can provide an independent opinion on the results of cleaning and if necessary, investigate the causes of poor water quality. In such cases we follow the guiding principles outlined in BSRIA guide BG29/2012 Pre-commissioning cleaning of pipework systems. Commissioning is the process of setting a newly installed system to work in accordance with the designer’s specified requirements. For heating and chilled water systems, a large part of commissioning involves the proportional balancing of flow rates. Regulating valves must be adjusted such that each pipework branch receives it’s correct design flow rate. To be effective, commissioning must be carried out in accordance with procedures detailed in standard guides and codes such as CIBSE Commissioning Code W. Compliance with the Code is only possible if the correct valves are installed in the suitable locations. We can advise on valve selections and system commissionabilty. Where commissioning results don’t make sense or fail to meet the requirements of Code W we can investigate to establish the cause. Pipework noise is a common problem. Noise is often caused by excessive velocities through pipes and valves. A whistling noise is sometimes noticeable at control valves such as thermostatic radiator valves (TRVs) and two port control valves (2PVs). If the velocity is high enough and the static pressure is low enough, a whistling noise may indicate cavitation in the valve. Cavitation is the localised vaporisation of water inside the valve. Vapour bubbles form in high velocity, low pressure regions. When these bubbles move into higher pressure regions, they collapse with astonishing energy – sufficient to cause physical damage to the surrounding metal surfaces. The key to avoiding excessive velocities is to control pressure differentials across valves. This can be done using differential pressure control valves (DPCVs). 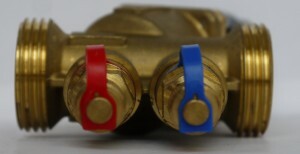 These types of valve are specially designed to remove pressure enabling TRVs and 2PVs to close against lower pressures. Pressure independent control valves (PICVs) combine DPCVs with 2PVs. These valves avoid the need for differential pressure control valves. Sometimes, noise is caused by pipe vibration rather than velocity or pressure issues. The vibration of the pipe is transmitted to the building fabric which then generates a noise that is noticeable in the surrounding spaces. 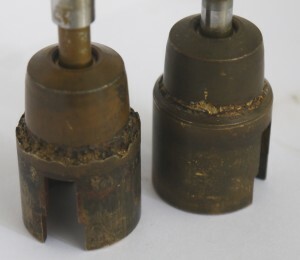 Pipe vibration may be a symptom of flow surges caused by problems such as malfunctioning valves or by pumps operating under partially filled conditions. System venting and pressurisation are critical to avoiding these problems. We can investigate noise related issues including the independent testing of valves and other components. Where excessive velocities are a problem we can also advise on the selection and location of DPCVs and PICVs to eliminate the problem.